Christmas & birthdays, I will be able to show them and know that I will receive something beautiful and worth the price. You are selling my favourite dichroic jewellery at better prices than the only shop I know about in my area so I am very happy to encourage others to buy (as long as there is enough left for me to buy). 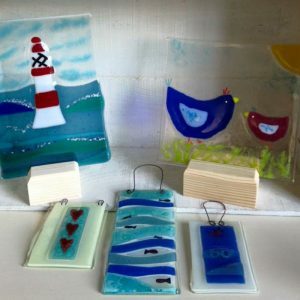 Linda creates a stunning range of dichroic jewellery, beautiful glass hearts and individually designed glass pictures - all handmade in Linda's Dorset studio. Recycled bottles are used to make Linda’s range of Funky Bottle Clocks.